3Süleyman Demirel Üniversitesi Tıp Fakültesi Ortopedi ve Travmatoloji Anabilim Dalı ISPARTA Introduction: Delirium is a serious cause of morbidity and mortality for geriatric patients with hip fractures. 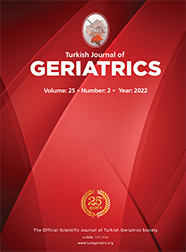 The aim of this study is to investigate the prevalence of postoperative delirium after hip fractures in Turkey in the presence of certain risk factors, and to determine the effects of anesthesia on postoperative cognitive functions. Materials and Method: 70 patients with hip fracture (≥60 years) were included in this study. All patients were evaluated with Structured Clinical Interview for DSM-IV, Mini- Mental State Examination (MMSE) and Delirium Rating Scale (DRS) preoperatively and postoperatively. Results: Of the 70 hip fracture patients 16 (22.9%) developed post-operative delirium. On multivariate analysis, delirium history, older age (≥75 years) and metabolic abnormalities were found to be the predisposing risk factors for postoperative delirium. Type of anesthesia, presence of a chronic disease and multiple drug use were not found to be the precipitating factors for postoperative delirium. Cognitive functions were impaired for all the patients according to MMSE and DRS scores.